HESS J1834-087 - Another Supernova Remnant? 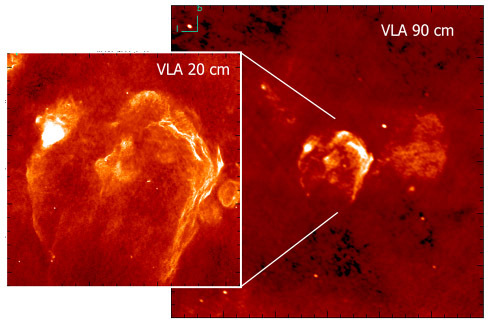 VLA images of the Galactic Plane around 23.3 degr. longitude, showing the supernova remnants G23.3-0.3 (center) and G22.7-0.2 (left on the 90 cm image). The 90 cm image shows a 2 by 2 degree field of view. The 20 cm image resolves the fine structures of G23.3-0.3. From	White et al. (2005), see also	web interface to VLA charts. Among the highlights of H.E.S.S. are certainly the resolved supernova shells RX J1713.7-3946 (seehere for newer results) andVela Junior. However,Green's catalog lists well over 200 supernova remnants, most of them near the galactic plane. Many of these remnants are too small to be resolved by H.E.S.S., being too far away, or embedded in a dense medium slowing down their expansion. A number of sources detected in the H.E.S.S. survey of the Galactic Plane (Science,Astrophysical Journal) coincide with supernova remnants listed in Green's catalog. One interesting coincidence is of the new source HESS J 1834-087 with the remnantG23.3-0.3, also known as W41. Originally discovered as a radio source byWesterhout (1958) (see alsoLarge et al. 1961), the source was mapped with theVLA array at 330 MHz(Kassim 1992) and at 20 cm and 90 cm (White et al. 2005,Helfand et al. 2005), resolving a highly structured shell of about 0.5 degr. diameter, adjacent to a fainter remnant G22.7-0.2 (top images). The distance to G23.3-0.3 is estimated to about 5 kpc. 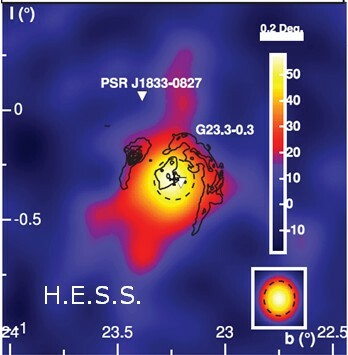 The gamma-ray source HESS J1834-087 is centered on G23.3-0.3 (Fig. 1), rendering an association of the source with the remnant very likely. With a (rms) size of 0.1 degr, it is clearly an extended source, wider than the point spread function of the instrument, indeed favoring a Galactic origin. 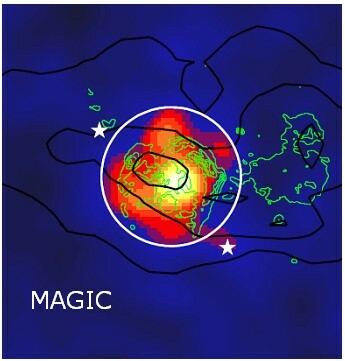 Recently, the source has also been deteced by the MAGIC telescope (Albert et al. 2006), see Fig. 2; source size, position and gamma-ray spectrum (Fig. 3) agree with the H.E.S.S. detection. The detailed origin of the gamma rays, however, remains to be resolved. A 0.5 degr. supernova shell filled with cosmic rays would represent a somewhat larger source of gamma rays; some mechanism seems to enhance emission near the center of the shell. At other wavelengths, no pulsar or pulsar wind is detected which could be responsible for the gamma ray emission. On the contrary, it has been speculated (Gaensler & Johnston 1995) that the pulsar PSR J1833-0827, now well outside the remnant (Fig. 1), might have been created in the supernova explosion, with such a large speed that is has since left the shell. Indeed, the pulsar is measured with a very high speed of over 700 km/s (Hobbs et al. 2005), and a consistent distance. Gamma-ray emission from the interior of the shell might be enhanced due to the presence of a dense molecular cloud, as pointed out by	Albert et al. (2006); indeed, given typical supernova energetics, a relatively dense target would be required to explain the observed gamma-ray flux in terms of accelerated protons interacting with the local medium. Future deeper observations and data on X-ray emission may be required to identify the mechanisms at work. Fig. 1: H.E.S.S. TeV gamma-ray sky map (colors) of the region of G23.3-0.3. The black lines show the radio contours, the triangle indicates the pulsar PSR J1833-0827. The small inset shows the point spread function of the instrument, taking into account the smoothing applied to the image. Fig. 2: MAGIC gamma-ray image of the same region. In addition to the green radio contours, CO emission contours (Dame et al. 2001) are shown, integrated over the relevant velocity (i.e. distance) range from 70 to 85 km/s. From	Albert et al. (2006). Fig. 3: Gamma-ray energy spectrum of HESS J1834-087, as measured by H.E.S.S. (blue points) and MAGIC (red points,	Albert et al. 2006). 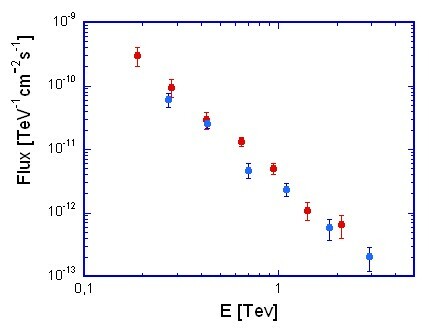 The spectral index is about 2.5; the small difference in flux normalization is within quoted systematic errors and might also be related to a slightly different size of the region over which the gamma-ray flux is integrated.